In the first part of this series I said I wouldn’t be discussing individual character spin-offs with a few exceptions. This is the main one. 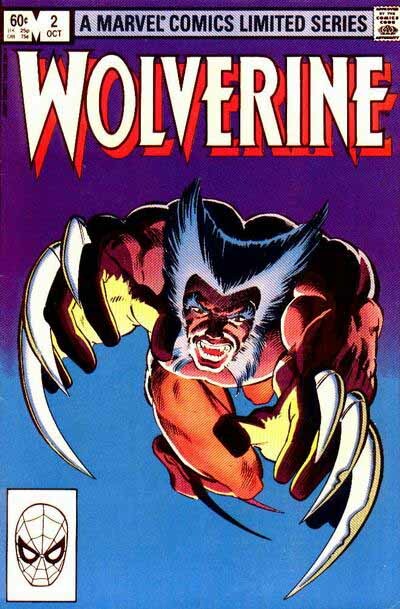 In 1982, WOLVERINE, a four-issue mini-series written by Chris Claremont, art by Frank Miller, became the first solo spinoff, and I think the first spinoff of any kind from the regular UNCANNY X-MEN comic. And it featured a terrific logo designed by letterer Tom Orzechowski, one of those rare logo designs that seems to fit the character perfectly. A good indication of that is that the logo is still being used today on the current book featuring the character, a rare example of logo longevity. What makes it such a good match? Well, it’s pointy, like Wolverine’s claws, most obviously in the W, V and N, but there are points everywhere except on the O. Stylewise it’s a little old-fashioned. Tom’s inspiration for logos and lettering often came from 1930s posters and advertising. The letterforms at the heart of this design are art deco with an overlay of pointiness. I think that also fits the character of Logan, known as Wolverine. Finally, it’s just a cool design, very classy and elegant. Were I asked to create a logo for the book at the time, I probably would have done something much rougher, trying to express the violence of the character’s actions, and the animal he’s named for, but Tom’s solution was and is much better. 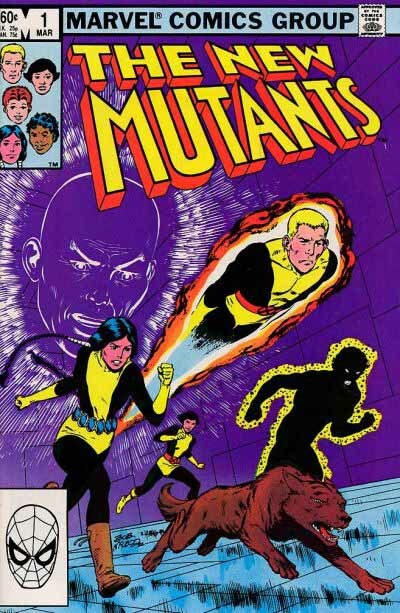 1983 saw the beginning of the first team spinoff from the X-Men, THE NEW MUTANTS. They first appeared in a graphic novel, then moved into this regular monthly book. Featuring a team of young new recruits, New Mutants focused on their training and schooling, leaving the main team free to range the globe and join up with other heroes when necessary. This is another logo design by Tom Orzechowski, and below are some sketches he did while developing it. Like Wolverine, the letterforms on these sketches look back to the 1930s, with the second one in particular having a very art deco feel, and telescoping that would have fit right into a 1930s movie poster. 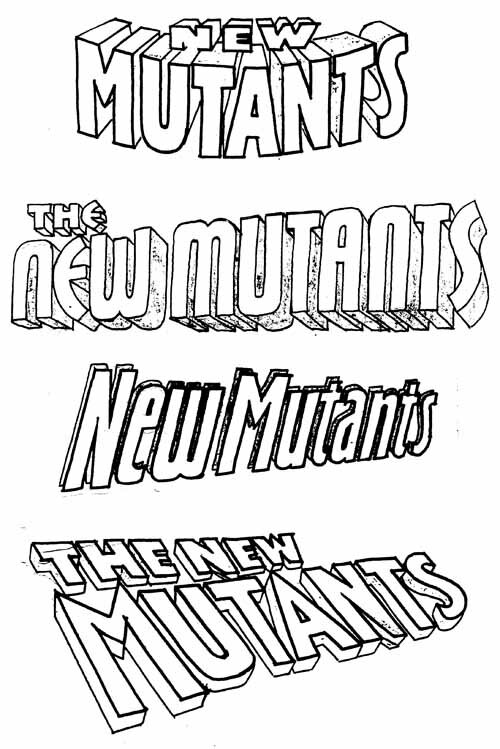 The final sketch, obviously the one chosen, follows the basic design idea of the Jim Steranko X-Men logo. It’s interesting to see where changes were made for the final version: several letters are more pointed, and the angle of perspective has been altered so that the letters are not leaning back as far. While I think this logo worked fine for the book, there are some elements that bother me. The A seems to get too narrow at the top, I would have either given it a squared-off top or lowered the inner triangle. And in adding points to the first N and the W, Tom has allowed the inner shapes of those letters to become distorted. Despite that, I like the logo. It once again has a certain conservative elegance and style that is appealing, and it’s very readable. 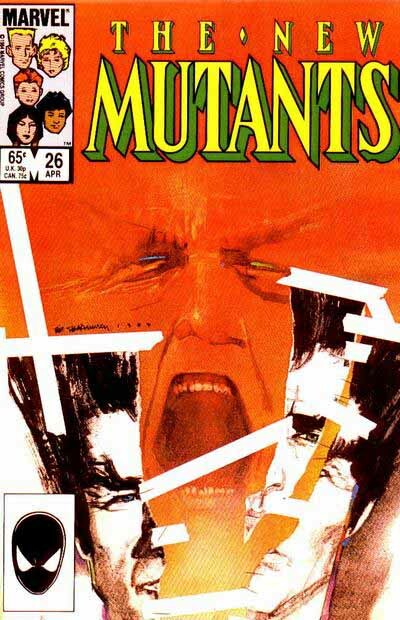 With this 1985 issue, NEW MUTANTS was given a new logo, designed by Alex Jay, a New York freelancer who had begun designing logos for Byron Preiss and others just a few years earlier. It’s again a fairly conservative logo, using tall serif letterforms with lots of points. In this case the letterforms are closer to classic type forms such as those in the Times font, though very stretched vertically. These classic forms, with thick and thin variations in the strokes and small curved serifs, developed over centuries from the earliest printed type, in a sort of trial and error way, as printers tried to figure out what was most readable. Using them gives a designer a big head start: they’re familiar and easy to read. Alex did a nice job with the spacing — very wide on the top line, very tight on the bottom line, which helps to balance the two lines despite the great difference in size. And the telescoped drop shadow also helps the readability by tying the letters together and offsetting the background art. 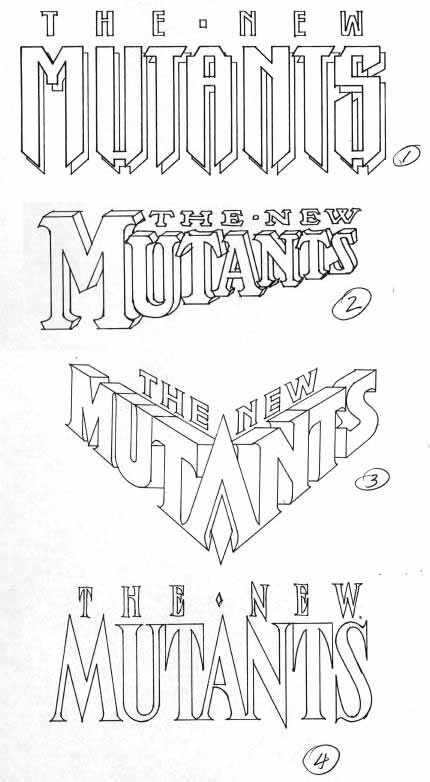 I met with Ann Nocenti on August 17, 1984 to discuss the New Mutants logo. She wanted to break away from the look of Steranko’s X-Men logo. Ann said I could do whatever I wanted, then she showed a book or poster with a type design that Bill Sienkiewicz liked: widely spaced letters with a bullet between the letters. She asked that I do a few designs in that style. I completed a set of tight renderings on September 4. Sketch 1 showed the influence of lettering found in the book, The Mike Hinge Experience. Sketch 2 recalled the look of the science fiction pulp magazines, Astounding Stories and Amazing Stories. Sketch 3 was the most dynamic of the four designs. (In 1987, I used a similar design for Marvel’s New Universe title, Codename: Spitfire.) Sketch 4 (sans shadow) had letters in the style that Bill liked. A preliminary sketch with bullets between the letters looked too busy. The only decorative element was a single diamond between the words “The” and “New”. Two days later I met with Ann; I had high hopes for sketch 3 but she chose number 4. The finished art was delivered on September 21. Well, I was right about the SF pulp influence on version 2, at least. Man, Alex, you were good at keeping notes on these things. All I have to go on is my fading memory. What a great insight into the design process. And as often happens, the designer’s favorite isn’t the one chosen! Next time: more X-Men spinoffs, and more design sketches as we get into the later 1980s and early 1990s, when the X-Men franchise really started expanding. This entry was posted in Logo Studies on October 5, 2007 by Todd. If I recall correctly, the Alex Jay logo hit the book around the same time Bill Sienkiewicz started doing lots of NM covers, most of which were gloriously loony, and I think looked better anchored by Jay’s even more conservative take than they would have with the deco marquee-ness of the original Orzechowski logo. The New Mutants logo #1 in the second batch looks like it was reused later for Magneto’s logo (as in this one-shot) from 1993). Not identical, but pretty close. Looks like Magneto’s later logo is a derivative from that one. I knew it looked familiar, it just took a bit to remember where it came from. No, that was one of my designs, and I never saw Alex Jay’s sketches until a few weeks ago. Both are very vertical with diagonal pointed ends, and some letters are similar, but it’s a coincidence.